1912 Photoplay, the first true movie "fan" magazine, debuted and gave rise to the whole idea of a celebrity and fan culture. By the early 1920's, over a dozen such magazines crowded the news-stands with names like Cinema Art, Film Fun, Motion Picture Journal, Movie Weekly, Picture Play, and Screenland. 1912 Carl Laemmle merged his IMP (the Independent Moving Pictures Company) with other independent production studios to found the Universal Motion Picture (or Film) Manufacturing Company, which was to become the first major, long-lasting Hollywood studio. Significantly, the independents made longer 'feature' films than the short one-reelers produced by the MPPC. 1912 Jesse Lasky formed the Jesse L. Lasky Feature Play Company in partnership with his brother-in-law Samuel Goldfish (later renamed Samuel Goldwyn) and Cecil B. DeMille. 1912 Reportedly the first ever closeup shot in a motion picture was of Mary Pickford (as orphan Dora) in the silent film short Friends (1912). 1912 Adolph Zukor founded an independent film studio named the Famous Players Film Company, with the release or distribution of films arranged with a new start-up organization named Paramount Pictures Corporation by 1914, the first successful nationwide distributor. 1912 Adolph Zukor's Famous Players' first release (opening in New York City at the Lyceum Theatre) was the four-reel French import Queen Elizabeth (aka Les Amours de la Reine Élisabeth) with famous stage actress Sarah Bernhardt in the title role. It was the first full-length drama shown in the United States, and the third film to be shown in its entirety, in its US premiere in July. New York society elites attended the premiere of the film, helping to extend the film's reach (and the entire medium of film) to the upper classes and bring respectability to the new medium of film. 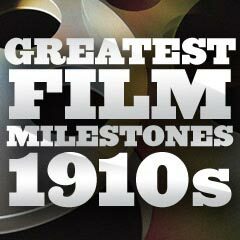 1912 By 1912, fifteen film companies were operating in Hollywood. 1912 It has been claimed that London Evening News correspondent W. G. Faulkner, who began a regular 'kinema' weekly column on January 17, 1912, was the UK's first film critic. 1912 The first American serial film was the Edison Company's melodrama What Happened to Mary? (1912) (12 episodes, each consisting of one-reel), starring actress Mary Fuller. A print version of the storyline was concurrently published in McClure's Ladies' World magazine. 1912 H. A. Spanuth's five-reel production of Oliver Twist (1912) was released - it was the first US-produced film to last over an hour (the definition of a feature film), and to be shown in its entirety. Only four of its five reels have survived. In the same year, director Thomas Bentley's Oliver Twist (1912, UK) was the first British feature-length photoplay. 1912 A feature-length Kinemacolor silent British documentary With Our King and Queen through India (1912, UK) (aka The Delhi Durbar or The Durbar at Delhi), originally 126 minutes in length (it was composed of a set of films) and the longest film-show to date, was the world's first color blockbuster. Only about 10 minutes of the original film survived. The film recorded the 1911 Delhi Durbar - a spectacular ceremony held in Delhi, India to recognize the newly-crowned King George V as Emperor of India. 1912 The dramatic romance Lorna Doone (1912, UK) was the first British five-reel feature. 1912 The five-reel Richard III (1912), starring Frederick Warde, was thought to be the earliest surviving complete feature film made in the US. 1912 The process of panchromatic film was first made or devised in 1912 by French producer Leon Gaumont. [Kodak Eastman, the leading supplier of film stock, introduced panchromatic film in September 1913 for the US market.] Panchromatic film was a type of black and white film sensitive to light of all colors (including red), thereby making the picture more realistic. The first feature film made entirely with the new emulsion (panchromatic negative film stock) was The Headless Horseman (1922). 1912 Female director Alice Guy-Blache's short film A Fool and His Money (1912), made by her Solax Studios in Fort Lee, NJ, was notable as the first film ever made with a cast comprised only of African-American performers. 1912 Director Étienne Arnaud's Saved From the Titanic (1912), a one reel, 10 minute film (a "lost film" destroyed in an Eclair American studio fire in 1914), was released (it premiered on May 14, 1912, a month to the day after the ship collided with the iceberg) - it was the first film adaptation about the disaster. The film was based upon actress, star and co-screenwriter Dorothy Gibson's true story of her own survival. Gibson, who starred in the film as Miss Dorothy, was one of the survivors who was rescued from the ship, and reportedly wore the same clothes from the rescue in the film. It was notable that Kinemacolor (the first attempt by the film industry to colorize film) was used in two scenes. The rare and restored German film Night and Ice (aka In Nacht und Eis) by actor/writer/director Mime Misu was one of the earliest disaster films. This film was the second of many feature films about the doomed ship that sank in 1912 on its maiden voyage, after striking an iceberg. This film was made and released a few months after the RMS Titanic's actual sinking! It was of epic length (35 minutes) in comparison to other films of the time. 1912 D. W. Griffith's The Musketeers of Pig Alley (1912) was released - possibly the first gangster or organized crime film. 1912 Thomas Ince pioneered the role of film producer by devising standard production budgeting formulas and introducing a detailed shooting script. 1912 Kalmus formed the Technicolor Company to market early versions of the color process. 1912 Director Enrico Guazzoni's overblown but successful two-hour spectacle Quo Vadis? (1912) was released - one of the first films with over two hours running time. It is often considered the first successful feature-length motion picture. Italian epics would briefly dominate the international film market. 1912 The first Indian feature film opened in Bombay, India -- the 12-minute silent Pundalik (1912), a B/W short about the Hindu saint Pundalik. 1912 One of the screen's earliest romantic pairs was Francis X. Bushman and Beverly Bane, who first co-starred in Jack Conway's short crime drama House of Pride (1912). They were to appear in dozens of films together (for Essanay and Metro), and were considered as the first popular romantic team in US films. [Future romantic pairings included Greta Garbo with leading man John Gilbert, and Ronald Colman with Vilma Banky.] In 1918, Bushman's scandalous extra-marital affair with his long-time co-star Bayne became public, and after divorcing his older wife, Bushman secretly married Bayne (the studio feared they would lose popularity). 1912 Canadian writer and actor Mack Sennett (the "King of Comedy") left Biograph and formed the Keystone Film Company (and Studio) in Edendale (Echo Park/Glendale), a suburb of Los Angeles. The first Mack Sennett Keystone production was Cohen Collects a Debt (1912). The first Keystone Kop film from the studio, Hoffmeyer's Legacy (1912), was released in late 1912. Nearly every major comic performer in America worked at Keystone during this time, including Fatty Arbuckle, Mabel Normand and Charlie Chaplin, in mostly slapstick comedy films. The studio was noted for many film milestones or landmarks: Chaplin's first film, the first feature-length comedy, etc. 1912 The first Keystone Kops comedy released by Keystone Studios, featuring a group to be known as the Keystone Kops, was director Mack Sennett's Hoffmeyer's Legacy (1912), a lost film. It was the first of twelve Keystone Kops films. The first real (or seminal) Keystone Kops film was released a year later, The Bangville Police (1913). 1912-1913 Motion pictures moved out of nickelodeons and into real theaters. The first movie palaces began to appear in 1913. Movies became longer and more expensive as movie companies started hiring the biggest names in theater to star in their movies. Motion picture acting gained respect and was no longer looked upon as degrading, due in part to greater attendance from the American middle-class. The public singled out certain actors and actresses as special favorites. Some of the actors and actresses who were the very first movie stars included cowboy actor Bronco Billy Anderson and comedian John Bunny.